There is no question that Donald Trump is a bitter enemy of of press freedom and the Constitution’s First Amendment. He has relentlessly maligned the media in an attempt to persuade his followers that he is the only source of truthful information about the government and his administration. It’s a tactic that has been favored by authoritarian tyrants throughout history. Trump’s attacks are are rooted in his seething fear that honest journalism will educate the public about his incompetency and criminality. So he has taken to calling any reporting that is critical of him “fake news”. While most Americans see through this infantile name-calling, his base of “Deplorables” devour it with an all-consuming ignorance and cultish devotion. “In 2017, the 45th President of the United States helped sink the country to 45th place by labeling the press an ‘enemy of the American people’ in a series of verbal attacks toward journalists, attempts to block White House access to multiple media outlets, routine use of the term ‘fake news’ in retaliation for critical reporting, and calling for media outlets’ broadcasting licenses to be revoked. President Trump has routinely singled out news outlets and individual journalists for their coverage of him, and retweeted several violent memes targeting CNN. 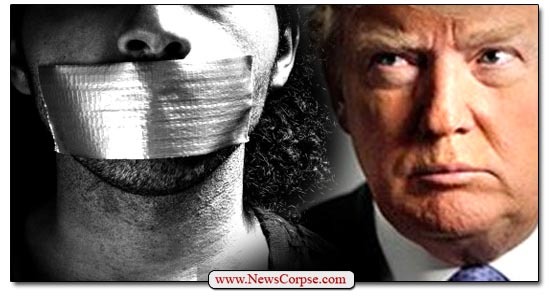 The violent anti-press rhetoric from the White House has been coupled with an increase in the number of press freedom violations at the local level as journalists run the risk of arrest for covering protests or simply attempting to ask public officials questions. Reporters have even been subject to physical assault while on the job. Trump’s gnawing loathing for the press is also apparent in his avoidance of any scrutiny by independent journalists. He has not had a solo press conference in over a year. The only one he has held as President was shortly after his inauguration. Nor has he submitted to an interview with anyone other than friendly “news” outlets like Fox News and the Christian Broadcasting Network in nearly a year. Unfortunately for our frightened president, his cowardice has been noticed by the majority of America’s citizens. They understand that a leader who is afraid to face the press is not a leader at all. Consequently, surveys that asked who the people trust more – the media or Trump – consistently show that the people have greater trust for the media than for the spineless cretin temporarily occupying the White House. And that, at least, is a hopeful sign for the future. We are that high? I thought by now we would be at rock bottom. So it is possible under the trumeter’s leadership, excuse the pun, we still can go lower? Got news for you, Darth Sidious. It’s not just the “fake news liberals” who hate you. And that number is growing daily, thanks to your bigotry, egotism, and narcissism.